After introducing the tools you’ll need to develop apps in my previous post, I assume you’ve installed Xcode and are ready to get a taste of app development! I find there is no better way to learn than by doing, so let’s dive in and start creating an app. Whenever I create an app for myself or a client, I always create a prototype of the app first. With Xcode, Apple’s tool for creating iOS apps, you can create high-quality prototype apps that appear mostly functional while writing little or no code. This is a real advantage for budding app developers who don’t know a programming language yet. Creating a prototype is a best practice. It allows you to get your app into the hands of potential users and beta testers and receive valuable feedback from them. It’s much more difficult to change an app after you have spent many hours writing code associated with a particular user-interface design! One of the best things about Xcode’s prototyping capabilities is that you don’t throw your prototype away when you’re ready to create the “real” app. You can keep the user-interface layout, navigation, and basic functionality of the prototype app, and simply add code to make it fully functional. I’ll take you through this process in the upcoming weeks as we first build a prototype, and then turn it into a real app. I find it’s best to learn how to create iOS apps by making an app that is fun and informative. With that in mind, in the upcoming weeks we will build an app called iAppsReview that can be used to review the apps on your iOS devices. When I’m designing an app, I usually start out by drawing the app’s main screens on paper first. This allows me to work out the basic look and navigation flow of the app more quickly than using Xcode to lay out my initial ideas. Once I’m happy with the basic app design, I begin constructing one screen at a time in Xcode, using my pencil and paper design as a guide. I’ve already done this part for you, so let’s take a look at the main screens in the app so you can get a good overview of what the app looks like as well as the main features it has to offer. Notice there is an icon to the left of each option. I find that users appreciate seeing an image that helps them quickly identify each main action in an app. This is a technique Apple uses in many of its built-in apps such as Settings, Photos, iTunes, and the Music app. On the right side of each option is a gray arrow. This indicates that when the user taps one of the options, they will be taken to another screen. For example, Figure 2 shows the Write Review screen, which appears when the user taps the Write a Review option. When writing a review, the user tap the App Category option at the top of the screen, which takes them to another screen where they can select an app category from a list. The main screen includes the Tap to Rate stars recognizable to users from rating apps and books in iTunes Store and the iBookstore. There is also a place for users to enter the app name as well as a larger text area to write comments. At the right of the screen is an Add Image button, which the user can tap to select images of the app that they have taken on their device. After selecting a photo, a small thumbnail of the image is displayed in the button. At the bottom of the screen is a Post button, which users can use to post their reviews to a website I have set up for this purpose. So eventually, you will learn how to create an app that can communicate with a web server over the internet! Users can also share their reviews with others by tapping the action button on the right side of the bar at the top of the screen. When they tap this button, a popup will appear allowing them to share their reviews via Twitter, Facebook, or email. When we add this functionality to the app, you will be amazed at how easy it is to integrate with social media using the latest tools from Apple. In subsequent posts I’ll detail the other options in the app, but for now, I’ve given you enough information to begin creating the app. To get started, you need to launch Xcode on your Mac by clicking the Xcode.app icon in your Mac’s Application folder. When you first launch Xcode, you will see a Welcome screen as shown in Figure 3. This window allows you to create a new Xcode project, or open a project you previously created. In Xcode, a project is a collection of files, including images, code files, user interface layout files, text files, and settings files. You can place all of these files in a project, and when you’re ready to test your app, Xcode runs a build, which takes all of these files, processes them, and combines them into a single .app file that can be run on an iOS device or on Xcode’s iPhone or iPad Simulator. Click the Create a new Xcode project option in the Welcome to Xcode window to create a new project. When you do this, the main Xcode window appears, and then the New Project window shown in Figure 4 is displayed. This window allows you to select a template from which to create your new project. This is similar in concept to selecting a template when creating a slide presentation or word processing document. The template provides your app with some basic layout and navigation features. On the left side of the New Project window is a panel with sections labeled iOS and OS X. These two options are available because you can use Xcode to create apps for iOS devices as well as the Mac. Since we are creating an app for the iPhone, under the iOS section, select Application, and then on the right side of the window, select the Empty Application template as shown in Figure 4. This is the best template to choose when creating a prototype app because it doesn’t add a lot of unnecessary files and user interface layout that you have to delete. Now click the Next button. When you do this, you are taken to the next step in the New Project window as shown in Figure 5. This next step allows you to specify project information as well as several project options. Click the Create button to create the new project. Figure 7 – Your new project! When Xcode finishes creating your new project, you will see a list of files in the Project Navigator pane on the left side of the Xcode window as shown in Figure 7. Since we created a new project from the Empty Project template, there are just a few files included in the project. The folders in the Project Navigator are called groups and are used to organize related files together. Note that these group folders do not correspond to actual folders on your Mac’s hard drive! They are just used to create a logical grouping of files. The AppDelegate.h and AppDelegate.m files contain program code, but since you’re not doing any coding right now, you don’t need to worry about them yet! One of Apple’s greatest innovations for making it easier to create iOS apps is storyboards. With storyboards, Apple takes a page right out of Pixar’s play book. In the same way that a storyboard is used to show the main scenes and flow of a film, storyboards in Xcode allow you to see the main scenes in your app, and the navigational flow between them. The storyboard in Figure 8 shows just a few screens from the app we will be creating. The iPhone-shaped rectangles are called scenes. The lines with arrows connecting the scenes are known as segues and they help you visualize the navigational flow of your app. Figure 8 – An Xcode storyboard shows the basic layout and flow of your app. In Xcode, click the iAppsReview group folder in the Project Navigator to select it, and then click the plus (+) button in the toolbar at the bottom left of the Project Navigator as shown in Figure 9. This displays a popup from which you should select the New File… option. Selecting this option displays the New File dialog (Figure 10). On the left side of the dialog, under the iOS section, select User Interface. On the right side of the dialog, a list of user-interface file templates is displayed. Select the Storyboard template. Figure 10 – Select the storyboard file template. Click the Next button, and in the next step of the window under Device Family, select iPhone (Figure 11) because we are making this prototype specifically for the iPhone. Figure 11 – Set the Device Family to iPhone. Click the Next button to display the Save File dialog. By default, new files are saved in the project’s main folder, which is what you want, so just change the name of the file to MainStoryboard.storyboard as shown in Figure 12, and then click the Create button. Figure 12 – Change the file name to MainStoryboard.storyboard. This adds the new storyboard file to the Project Navigator. Click on the MainStoryboard.storyboard file (Figure 13) and the storyboard is displayed in the center area of the Xcode window, within what is known as the Interface Builder editor. Figure 14 – In the Project Editor, set the Main Storyboard setting to MainStoryboard. Figure 15 – Select the AppDelegate.m file to display it in the Code Editor. Now delete the selected code by pressing the delete key. When you’re finished, the block of code should look like Figure 16. Now you’re ready to go back to the storyboard, but before you do, let’s talk about navigation controllers. In iOS apps, a navigation controller manages the navigation between different scenes. It presents a navigation bar at the top of the scene (Figure 17) which can contain a title, a back button, as well as other optional buttons. Figure 18 – The Object Library is at the bottom right corner of the Xcode window. Next, drag a navigation controller from the Object Library and drop it on the storyboard as shown in Figure 19. After you drop the navigation controller on the storyboard, there are a few things to notice as shown in Figure 20. On the left side of the storyboard is an arrow pointing to the navigation controller. This indicates that the navigation controller is the first scene to be displayed when the app first launches. You may have been surprised to see that two scenes were added when you dragged the navigation controller to the storyboard. The Root View Controller on the right contains a Table View that can hold a list of items. Table views are used to display lists of data and are found in most of Apple’s built-in Apps such as Settings (Figure 21), iTunes, Photos, and Mail. Each division of a table view is a section. For example, the table view in Figure 21 has three sections. Each item in a section is known as a row, and a table view can contain an unlimited number of rows. Each row is one column wide and can contain an image, text, and an accessory icon, such as the disclosure indicator (the gray arrow) shown on the right side of the rows in Figure 21. Several of the scenes in the app you are creating contain table views, so it’s good to become familiar with them. The last thing we will do in this week’s post is configure the table view in the root view controller. Figure 22 – Select the table view. 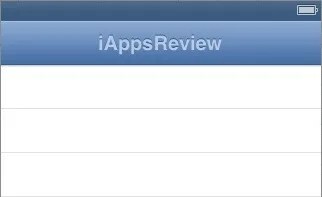 Change the title of the navigation bar by typing iAppsReview as shown in Figure 25, and then press enter. Figure 25 – Change the title to iAppsReview. Let’s run the app in the Simulator to check our progress so far. After several seconds you should see the app displayed in the iPhone Simulator as shown in Figure 28. If this is the first time you have run an app in the Simulator, you probably feel pretty excited to see it up and running! Figure 28 – The prototype app running in the iPhone Simulator! If the Xcode window is visible, click on it to go back to Xcode, otherwise, press Command+Tab to go back to Xcode, and then press the Stop button to stop the app from running in the Simulator. You have accomplished quite a bit in this post! So far you have learned how to create a new project, how to add new files to the project, how to create and configure a storyboard, and how to add a navigation and table view controller to a storyboard. In my next post we will configure the app’s main scene and table view so it looks just like the scene shown in Figure 1, and we’ll even add the next scene to the storyboard that allows the user to write a new app review.